You can and should optimize your website for search engines, but without a formidable link building plan, all the optimization in the world does little good. Are you wasting your time asking for reciprocal links? The sad truth is, reciprocal links are almost worthless in terms of search engine value. Link popularity, one of the most important factors in high search engine rankings, is achieved by getting high value, one-way links pointing to your website. It's no secret that link popularity is an extremely strong factor in getting high search engine rankings. The trouble is, most people go about link building all wrong! That's it, but of course, there's a lot to that. Industrial Strength Link Building is the only link building guide you'll ever need. Why? It's jam-packed with proven strategies that really do work—over 140 pages of mostly free and easy tactics and resources. It comes with free lifetime upgrades. You'll discover over two dozen ways to get important one-way links from the kind of websites that really count toward link popularity. You'll never need to ask for reciprocal links again! Most of these strategies are faster than getting reciprocal links, and they are all much more effective! Hey Dennis! Good grief! Could you GET any more comprehensive on the subject of link building? Industrial Strength Link Building isn't a book I could speed read, like I do most eBooks. This is quality information to use as a reference guide. Gotta tell ya - this is the MOST informative and valuable eBook I've read in a long time. Thanks so much for the great information, as well as the easy directions for implementing that information! 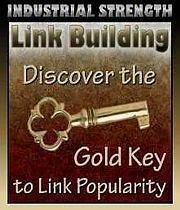 Industrial Strength Link Building is your Gold Key to the many and varied rewards of link popularity. The best on-site practices—use these to make your link building efforts more effective...starts on page 5. Learn what content sectioning is and why it's critical to search engine rankings for you to use this strategy...starts on page 16. Are you using search engine friendly URLs? If not, you're killing your search engine rankings...starts on page 19. Discover which kind of links will ruin your "trust factor" with the search engines...starts on page 20. Discover how to add a simple little code snippet to your site so your visitors can easily recommend your site at social bookmarking sites...starts on page 23. Can you acquire links too fast? Discover the answer...starts on page 25. Discover how to turn reciprocal links into much more valuable one-way links...starts on page 48. Discover how to create an RSS feed so others can subscribe to your channel. It's free! It's easier than HTML! It puts your site in front of people's eyeballs...starts on page 62. Discover the power of satellite sites and why you should be using them...starts on page 72. Learn what link dilution is so your site doesn't suffer lower rankings for this innocent but not uncommon mistake...starts on page 79. Discover why you should be using latent semantic language around your links...starts on page 89. There's a LOT more than that in this ebook. Some of these strategies will be new to you. Some you probably thought were too hard or too complex, but they're really not. Some you probably know of but greatly undervalue, as most webmasters do, so you're not properly taking advantage of them. You will be well pleased with Industrial Strength Link Building. It will open your eyes and give you a solid plan for building your website's link popularity to heights you'd only hoped for until now. You could get started in just minutes from now. This could be a new dawn for you. This could be the day you start realizing your hopes for more link popularity. New link building prowess is about to awaken in you . . . if you act on your rightful desire. I think you found this page for reason. As Dr. Wayne Dyer says, "The word coincidence does not describe luck or mistakes. It describes that which fits together perfectly." If you're looking to grow your website's link popularity, to gain higher search engine rankings, and to get more traffic to your site, that's what I offer you. Can you imagine thousands of one-way links all pointing to your website from all over the Internet? Because you can make it happen—easily. If you average adding just three links per day, you'll have 1,095 new links in one year. Three links per day can be added in 15 minutes or less. Just imagine how 1,095 high quality new links will boost your search engine rankings and explode your website traffic. And remember, these are high value links that count toward link popularity, not reciprocal links that mean next to nothing to the search engines. It's thought that one high value link is worth as much as 100 reciprocal links. There's nothing in this manual that will cause trouble for your site with the search engines. It's search engine safe, search engine legal! While this is industrial strength link building, it's also pretty easy. It just takes a little loyalty to the process. You obviously have the loyalty to your site or you wouldn't be reading this page. As a super-cool bonus you get free upgrades for life! Most companies offering free upgrades offer them for a limited time. A free upgrade sounds good, almost like you're getting several products for the price of one, but a lot of times they don't come out with even one single upgrade within that limited time frame. I don't use empty promises like that—you'll get every upgrade I release—and every one of them will be free. Sweet! Ten Great FREE Research Tools. This special report is ONLY available as an exclusive bonus with Industrial Strength Link Building. I wrote it just for this product, it isn't available anywhere else at any price! These free tools that I steer you to will help you build your web pages around the words people actually search for that are related to your content so your site can be found by the people looking for it. They'll check your site's link popularity, check how your site ranks for specific keywords, create site maps, grade your site from a marketability standpoint and more. These two products are the PERFECT combination! Will Link Building Work for You? You can create as many high value, one-way links to your site as you want. You can use these tactics for all the websites you own. You can do this without the assistance of other website owners—and yet you'll have their hearty approval! You can get links from a variety of websites, on-topic with your site or off-topic. Hint: You need both kinds of links. You can get links from sites with a high Google PageRank. There are many, many link building methods to choose from. Unlike other "systems" out there, you're not locked into any one link building method you're not comfortable with. It's all above board . . . there are no "black hat" tactics or search engine illegal strategies whatsoever. You never have to worry about running afoul of the search engines or other webmasters. More links to your website—as many as you want to add—from important, high value websites that will pump up your search engine rankings. With link popularity comes MORE: more website traffic, which means more sales opportunities, more newsletter subscribers, and more advertising revenue, as well as other opportunities that may surprise you. For example, I was "discovered" and asked by a publisher to write a book, which is now in the third edition. You just never know what may come your way when your site is well-linked. No worries about your website being penalized or banned at any search engines, everything is search engine legal. More prestige for your website because of its ever-growing popularity. More R-E-S-P-E-C-T for you because you're also building your own reputation as your website grows more and more popular. Get Industrial Strength Link Building Now! Yes—I want Industrial Strength Link Building now! I understand I can instantly download the 142-page PDF format ebook as soon as my order goes through. Industrial Strength Link Building—your path to link popularity—comes with a 30-day money back guarantee if you're not completely satisfied. You also get FREE upgrades for life, and a FREE copy of the special report, Ten Great FREE Research Tools. Industrial Strength Link Building is just $37.00 if you order today. Click the Buy Now button to get YOUR copy. PS: Link popularity is one of the most important factors in attaining high search engine rankings, perhaps THE most important factor with Google. You can sit around hoping hundreds or thousands of webmasters will all of a sudden get the urge to link to your site (like that will happen), or you can build your site's link popularity NOW. The longer you wait, the farther behind you fall. Don't be like the unrewarded masses, show everyone you really "get it" and take your site to the next level starting today. Getting higher search engine rankings is a choice you have to make, it doesn't just happen. What do you really want? The same old, same old—or the exciting rewards that come with having a popular website? "In the same way that Google trusts sites less when they link to spammy sites or bad neighborhoods, parts of our system encourage links to good sites." The first part of that sentence tells you linking to the wrong kind of sites will lower your site's trust factor. A lower trust factor equals lower rankings. When my site was hacked it ruined my search engine rankings. Once I cleaned up the hacker's hidden scripts, I had to rebuild my business. I wrote a free ebook about my experience and released it through a press release. That was my first experience with press releases, and it helped to turn things around for me. The press release was titled, Think Your Website's Safe From Hackers? Then You Don't Know Jack. I just searched for that exact phrase by putting quotations around it so only pages with that exact phrase will turn up in the search results, and Google listed 2,200 results. I can't say all of those sites carrying the story have linked to my site, but you can bet most of them did. That's a lot of link love in a hurry! Reciprocal links aren't near as valuable as one way links. You can turn reciprocal links into two one-way links and you and your link partner both benefit from it. You don't need a photo gallery on your website to share photos. The main thing you're after here is to get high PageRank one-way links from the photo sharing sites to your site. For example, Flickr.com has a PageRank of nine. Very few sites rank that high. Other photo sharing sites have a good PageRank as well, but Flickr.com tops them all, so links from Flickr.com are the most important. You don't have to give away your rights to the photos, at least not with all the sharing sites. You can set the usage rights and keep the copyrights if that concerns you, just allowing others usage licenses. Remember, in the Resources section I link to several places to get started in your link building campaign (over 1,800), and many photo sharing sites are included. When the average person thinks of an RSS feed they think of it as a way to read news feeds or to add news feeds or content to their website. Why not become a content provider? RSS has become a popular method of promoting content on your web site that you'd like others to find, and to keep anyone who subscribes to your feed informed on new or changing content. In that sense, it's another way of syndicating your content. Suppose you add a new article (page) to your web site. You naturally want others to find it, so you list the page as an "item" in your RSS file. Those who read information using RSS readers or "news aggregators" will have instant access to it as soon as they check their feeds if they subscribe to your feed. RSS also allows webmasters and bloggers to add links to your content within their own web pages. Hey hey, more links to your website! The basics are not hard at all, in fact, it's a lot like HTML. You can submit your feed automatically to several RSS directories, so that part is easy too. If you use a top site referral script, be aware that some older scripts allow people to cheat you. They can place their referrer link to your website in a 1 pixel by 1 pixel iframe on a popular page of their site, so every time their web page loads, your site loads invisibly in the iframe. They'd get credit for sending you visitors when they didn't really send anyone to your web site. Web directories have gone out of fashion, but still represent an excellent link building opportunity. They have gone out of fashion because most traffic comes from search engines, and also because a great many webmasters think they work the same as search engines. They do not work the same as search engines because they do not spider the web looking for new sites like search engines do. If you don't submit your website to a directory your site won't be listed in the directory, except a few that mix in search engine results with their own listings. Search engines spider directories just like they do the rest of the web, so your link in a directory contributes to your site's link popularity. Many directories have a decent PageRank, so these links can be very good indeed. As you build your links, vary the anchor text you use. The anchor text is the highlighted text that people click to activate the link. It's not natural to have every link to your site say the same thing. Part of effective link building is to make it seem natural. Even a few dreaded "click here" links are okay because it's natural, but make it very few because "click here" doesn't have any keyword value. Yahoo! isn't included in the directory list because they charge $299.00 to submit your site, and that doesn't guarantee inclusion. If you create a My Yahoo page you can add your own RSS feed to your My Yahoo page and Yahoo will pick up your site that way and it won't cost you anything. A few of the link building methods were hinted at in the above excerpts. If these aren't for you, don't worry, there are many, many others. Several of the link building methods are as easy as can be, requiring little more than filling in a couple form fields. Once you're on a target site, you can add links from these sites to your site in just a minute or two. There are links to over 1,800 sites where you can add links to your site in various ways. Every link building method won't resonate with you, but there's no need to use them all. Choose as few or many as you like and use those. I included many different ways to build links so everyone would have several link building methods they can use.